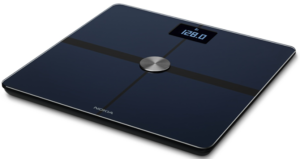 The Nokia Body+ Scale offers highly accurate weight and full body composition measures—along with coaching, rewards, and automatic sending of all data to the free Health Mate app on your iPhone or iPad. Importantly, it also saves your data to Apple Health to be harvested by HealthMetric. Whether your goal is to lose weight or to gain muscle, simply step on the scale to track body fat and water percentages, plus muscle and bone mass readings. Every weigh-in appears in the Health Mate app automatically viaWi-Fi or Bluetooth sync. The scale recognizes up to eight users automatically, and independently syncs their data to an individual Health Mate profile.